Based on an overriding commitment to quality and ecological responsibility, Hotel Granvia Kyoto provides guest rooms with Hahonico brand shampoo, hair treatment, body soap, makeup remover, and facial wash.
Our environmentally friendly dispensers allow guests to enjoy the same high quality and gentle, natural ingredients that have been praised by professional hair and makeup artists. Hahonico products are formulated to remove dirt while repairing damage, providing necessary nourishment, and bringing out the natural beauty of your skin and hair. We invite you to experience their quality and ease of use for yourself. This shampoo washes and repairs your hair, which can be easily damaged by everyday ultraviolet rays, shampooing, drying, and brushing before you realize it. This hair treatment gives damaged hair a soft, lustrous sheen after washing, further repairing and strengthening hair to prevent subsequent damage. This body soap is formulated to reduce the burden placed on the skin during washing by forming a high-volume lather. Enjoy a comfortable bathing experience as only this smooth, relaxing lather can create. This makeup remover is formulated so that it does not remove too much oil, allowing it to be used by individuals with dry or sensitive skin with complete peace of mind. This foaming facial wash includes a mild-acting detergent that not only washes, but also conditions the skin. We all have a role to play in protecting the environment. * This is the catchphrase for Kyoto, a model environmental city committed to pursuing green activities. 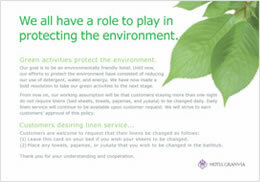 Green activities protect the environment. 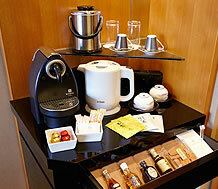 Hotel Granvia Kyoto's goal is to be an environmentally friendly hotel. Until now, our efforts to protect the environment have consisted of reducing our use of detergent, water, and energy. Now, we are undertaking a bold new initiative. From now on, we will assume that guests who are staying more than one night do not require linens ( bed sheets, towels and pajamas ) to be changed daily. 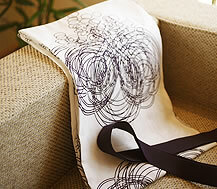 Of course, you may choose to have daily linen service and we will honor your choice. We sincerely hope you approve of this policy. 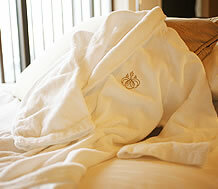 (1) Leave " ECO card " on the bed as a sign that you wish your sheets to be changed. (2) Place any towels or pajamas that you wish to be changed in the bathtub.